My colleagues at work are using Fujitsu Siemens (FSC) Lifebook S Series laptops, which are more or less thin 13″ computers with the usual flexibility and relatively low weight (1,7kg). Some strange policy by the government requires them to buy FSC machines as well as T-Mobile contracts for their mobiles — whereas I, as a freelancer/consultant, have to rely on my own system (and consequently also have to finance it myself). My own system is an HP nx8220 15,4″ notebook since autumn 2006 – a very reliable machine that also survived rural Kenya (~ power failures) and which I’ve disassembled a few times to exchange parts like another CPU, more RAM, new HDD(s), another screen, new keyboard, new touchpad and also a new battery. The only issue I am afraid of is that many other broken HP nx8220s for sale on eBay & Co. do have a faulty Northbridge controller chip below the touchpad, which would result in a costly repair (200-250,- EUR, reballing the chip) and what should hopefully never happen to my computer. To prevent this failure, and because my notebook actually weighs 2,8kg (plus the power supply cable), I’ve started using it at home only and relying on other machines at the office. However, as I would like to be more mobile, I thought about going for one of those new netbooks to have a 2nd, very portable computer. And this is where the story actually begins. I know a lot of other friends who are often travelling and attending conferences are tired of carrying their heavy MacBookPro around – which becomes obvious when you see ProBloggers like Ethan Zuckerman using (simple) 13,3″ MacBooks. What would I like my future portable computer (notebook/netbook) to have? These netbooks actually provide enough flexibility for me on the road, and if they all stay below 400,- EUR and weigh not more than 1,5kg each, I could easily agree on one of them (ask me in a month from now and I’ll probably name three other ones). However, netbooks are netbooks, and the Intel Atom N270 CPU and their chipsets aren’t that great – compared to full 12,x” notebooks that come with the same powerful CPU my own notebook currently has (Intel 750 – no CoreDuo etc.). What I am talking about are used subnotebooks like IBM’s X40/41, T40p (Steve! :-), HP nc4200, nx2400, Dell Latitude D400/410. These business models that intially sold for 1.500,- EUR and above to the corporate world, are now often selling for something like 300,- EUR. Despite of a worn out body, display and keyboard, they also often have an old battery, so you easily end up adding another 80,- EUR on a new battery. But still, these old subnotebooks are often still better than new netbooks. Especially the screen resolution is by far superior to the tiny screen on a netbook, even though some of the latter ones have a modern LED backlight screen. Depending on what you want (or rather: are able) to spend on a 2nd computer, I think it makes sense to consider going for a used subnotebook instead of a new netbook. I also buy my HP printers according to this philosophy: new cheap consumer printers = expensive cartridges, older business printers = cheaper cartridges. It’s like buying a used Mercedes instead of a cheaper, fully-equipped Korean car. The only part I still have to figure out is how to sync two computers – because I can only work on one machine at once and would still want to have my 50 GB of private data with me all the time. So here’s my question to anyone who ever wanted to have a lightweight computer for travelling: what would you do? Keep on carrying the old 2,8kg around until it falls apart, go for a restricted new netbook or buy one of those older subnotebooks for more or less the same amount most netbooks are currently selling for (300,- – 400,- EUR)? 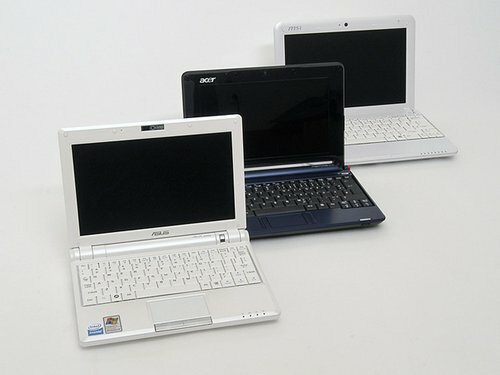 Other than that – what I really like about netbooks is that they provide affordable computing – much like the OLPC which apparently was the initial reason for Asus to start producing netbooks. I think we are yet to see in due time how quickly netbooks will replace mobile phones as the major online platform in Africa. Much like local WiFi networks started substituting 3G UMTS connections in the past (because it was simpler and easier to set up a local Wifi network than to wait for all network providers to update their infrastructure), I think netbooks have the potential to substitute the ailing browser development on mobile phones. WAP alone has been around for so many years now, and still the iPhone is the only phone with a decent online browser. Consequently, netbooks – because they are cheap and will in future also have a SIM card holder for an internal 3/3.5G modem – could imho be the ideal mobile platform – all over the world. I agree, I have looked at the new netbooks and compared them to the older subnotebooks. Pricewise it makes more sense to buy the older subs. Here in UK, they are flogging a lot of the netbooks on contract with the mobile networks, typically a 24 month contract with a price plan ranging from £20 a month on the lower tariff to £40. Assuming you sign up to such a binding agreement on the lower tariff, you will have spent a lot more than the netbook is worth. Even if I were to buy one cash, cheapest I have seen is Asus Eee at around £200. Compare that to a used Subnotebook such as Advent 8109 made by ECS Taiwan or even older models from about 4 or 5 years ago? One thing to consider with used subnotebooks is the fact that these things are often *really* worn out — dim backlights, scratched screens and so on. Quite a few of the X40s also tend to blow their southbridges sooner or later. And while they seem to be decently fast CPU-wise, their graphics are often very underpowered. Often they also don’t come with a webcam which may be handy for Skype and similar apps. Meanwhile I’m really tempted to get a MacBook (no Air, the regular one) instead. It’s more expensive, but it will keep its value for quite a time (50% after a few years is not rare) while a Netbook will be almost worthless after a year and you’re bound to look at all the other new fancy netbooks all the time then. It’s heavier, but not by much, especially since most Netbooks with a decent battery aren’t really light anyway. And you can use it for almost everything, not just for a bit of browsing, office apps and email. My worst nightmare is to end up with just *another* computer I have to care for and a netbook seems to be exactly that… another thing I have to move data on and off, to install and update apps and to configure and fix them and the OS again and again. Not good. Exactly – the need to keep both computers in Sync is my biggest nightmare. Even considered going for a SSD version to limit my activities on a netbook to a necessary minimum. I wish there was a netbook with a 1280×800 screen resolution AND a decent keyboard + battery runtime. Samsung’s NC10 comes close but it lacks the better screen. The solution may be to go for a 12-14″ notebook with a docking station and an external monitor at home. Or – as you proposed – a MacBook. Either way, it would be the right solution somewhere in the middle (max 2kg). With a recommended retail price of £100 sterling, it cant be used to make voice calls but is definitely a serious alternative to some of the new netbooks on offer.